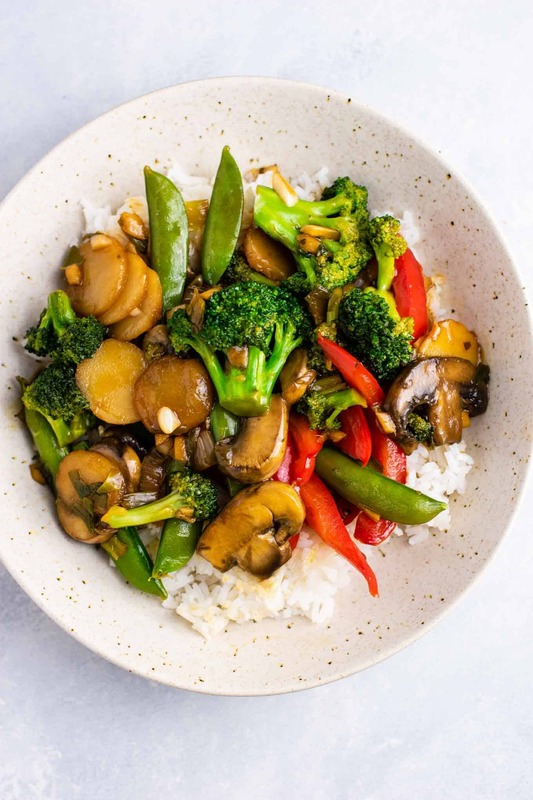 Stir fry veggies are a classic favorite – whether you serve them alone or as a side dish, everyone will love this simple recipe! I love the rainbow of color and flavor and how easy it is to make! No fancy ingredients are needed, just a bunch of fresh veggies and an easy 3 ingredient stir fry sauce! 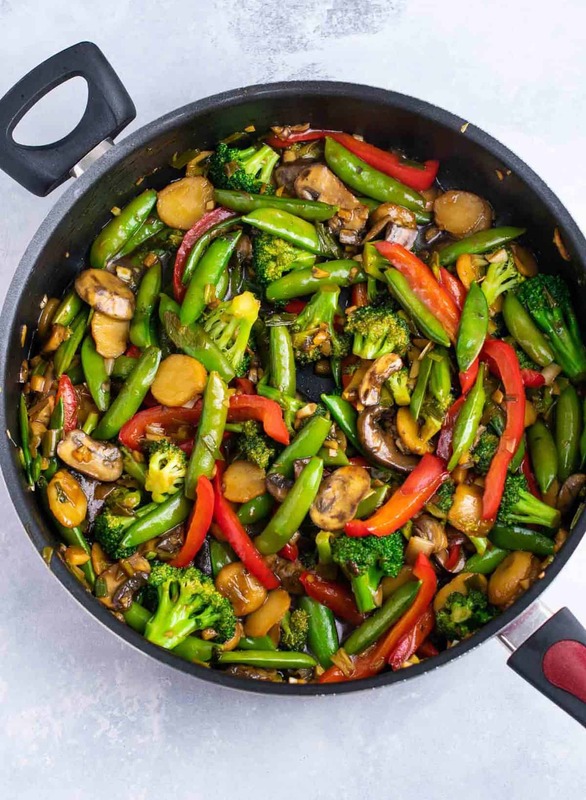 First, add water chestnuts, sugar snap peas, mushrooms, bell pepper, green onions, broccoli, garlic, and ginger to a large skillet or jumbo cooker with 1 tablespoon of sesame oil. 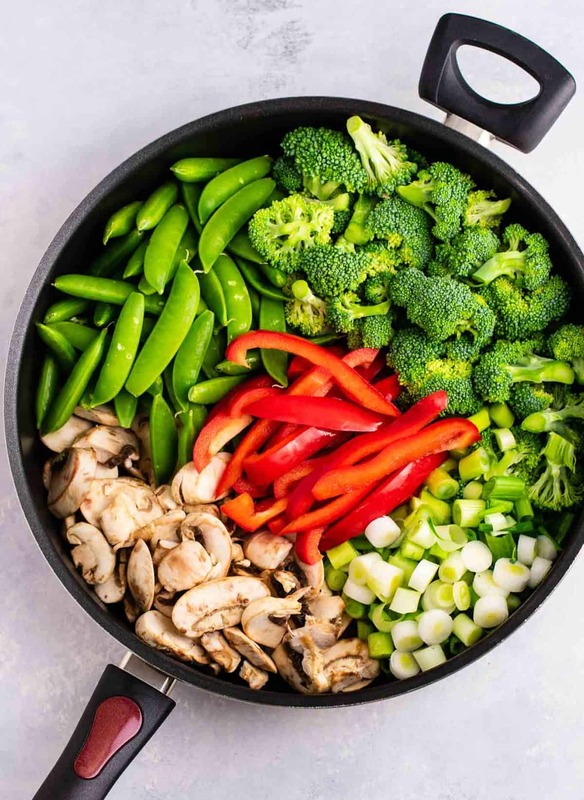 Cook the vegetables on medium high heat for 20 – 25 minutes, stirring often, until most of the liquid has evaporated and vegetables are cooked but not too soft. Texture is important here, we don’t want everything to be mushy! Add stir fry sauce and cook an additional 3 – 5 minutes, stirring frequently, until sauce is thick and sticking to the vegetables. Serve alone or over white or brown rice for a delicious meal or side dish. 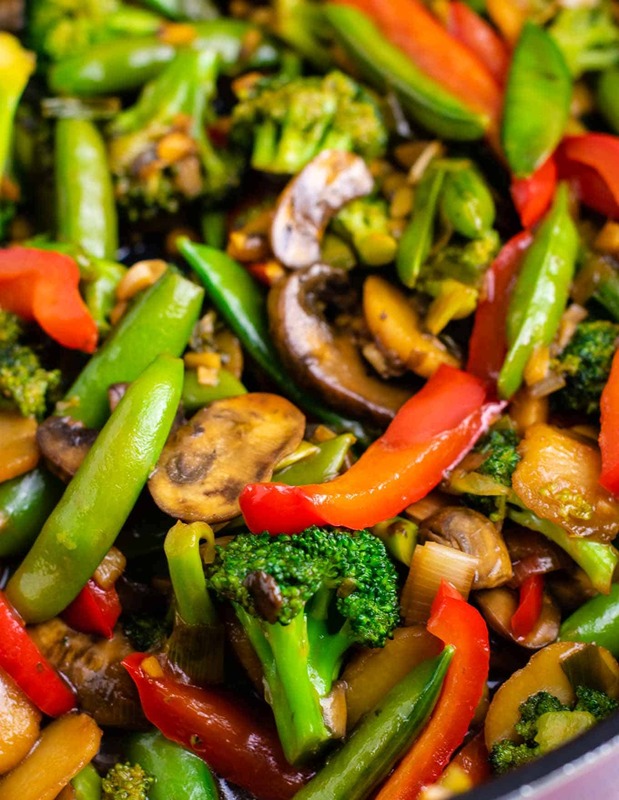 All of these vegetables pair so well together, and compliment the richness of the stir fry sauce. 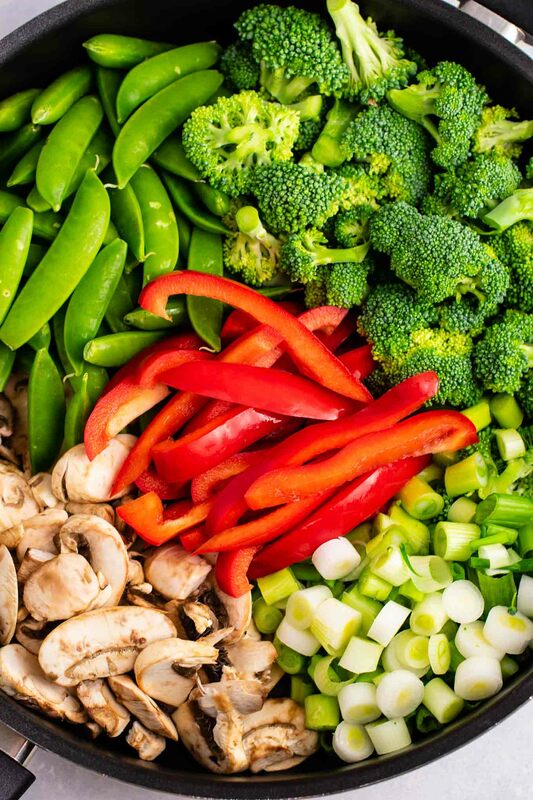 If you want to substitute any of these veggies for another stir fry veggie, check out my post on the best vegetables to use in stir fry recipes for more tips and tricks! Fresh minced garlic and ginger help tie together all of those oriental flavors of the stir fry sauce. 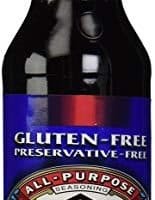 If you read my post on stir fry sauce, you know how important this step is! Never used fresh ginger before? Don’t be afraid! You can buy it at most any grocery store in the produce section. Just cut off the skin/peeling, and dice it up fine just like you would garlic. It’s really so easy! These vegetables offer a variety of textures and flavors, and when cooked together the result is so delicious! I am a big veggie lover, so this is like heaven in a skillet to me. I love eating so much fresh produce! 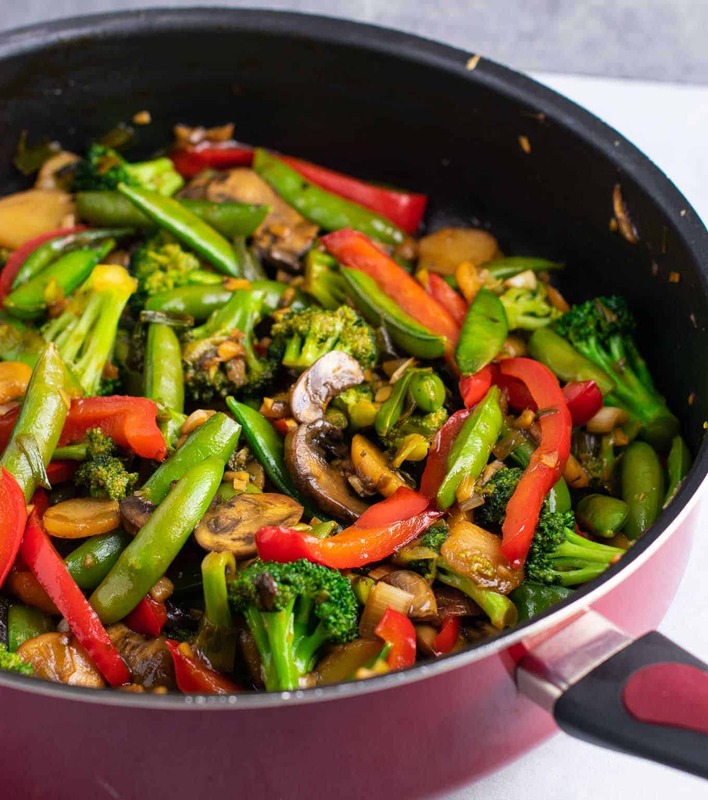 For this stir fry vegetables recipe, I use the stir fry sauce recipe that I now use for all of my stir fry recipes: my 3 ingredient homemade stir fry sauce. It’s ridiculously simple, no fancy long ingredient lists, and tastes incredible every time! As long as you use it with fresh garlic and ginger (like we are in this recipe!) the sauce is a winner every time. I’m so glad I discovered this recipe, it has seriously changed my life and we make WAY more stir fry recipes now more than ever before. You can read my post on how do you thicken stir fry sauce? 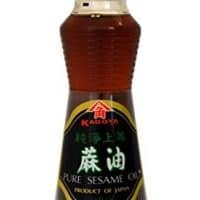 for more about why this sauce is the perfect easy choice for making homemade stir fry recipes. 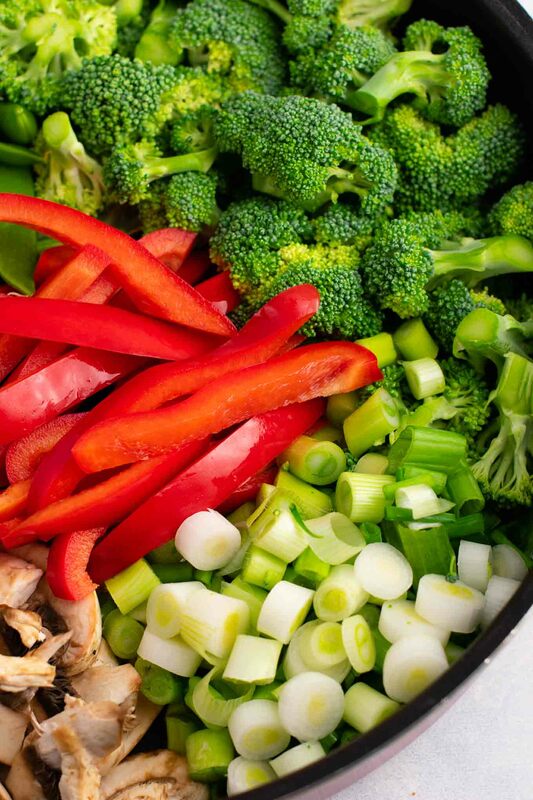 Would you just look at that big beautiful pan of veggies?! 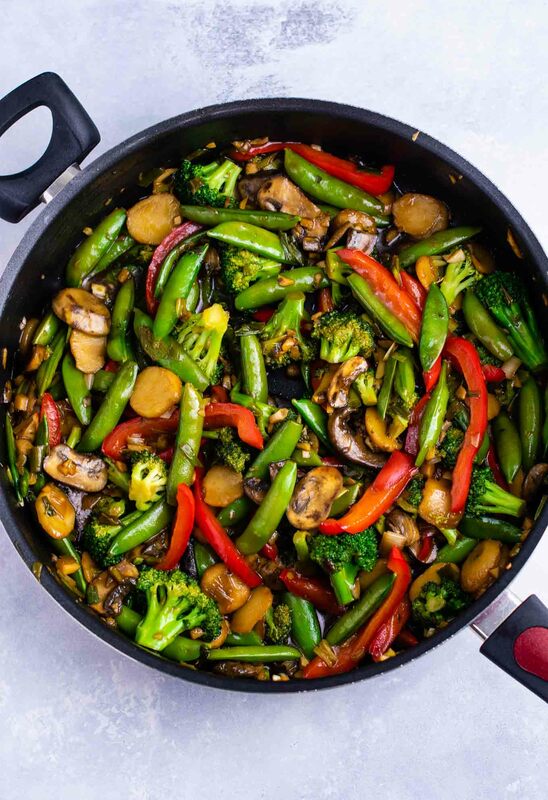 This recipe easily serves 4 people, and makes a huge amount of veggie stir fry. The pan pictured is called a Jumbo Cooker. I purchased mine at Walmart and I’ve been a big fan ever since. I believe I’m now on my third jumbo cooker in the last 8 years! It’s a well used and well loved pan in our house, and perfect for making huge stir fry recipes in! protein of choice (optional) – we love tofu or chickpeas! 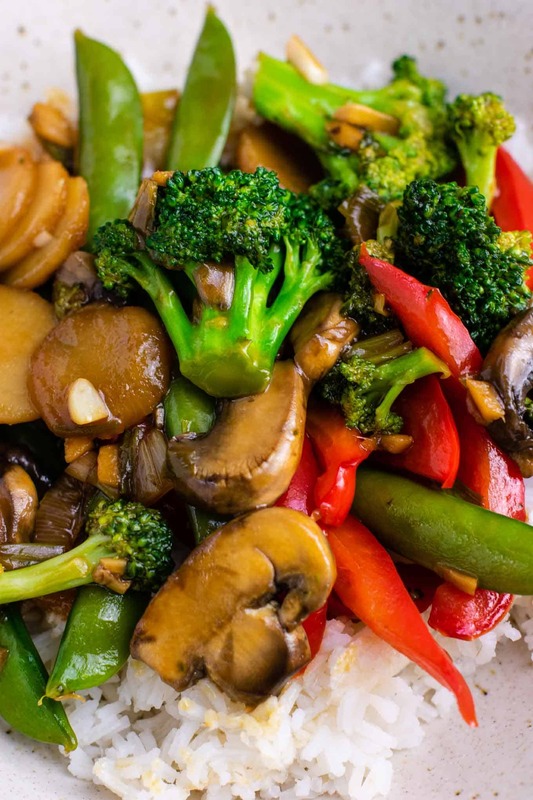 Bring the magic of takeout to your kitchen with this easy and yummy stir fry recipe! Are you making this recipe? I want to see! Don’t forget to tag me on instagram @buildyourbite and hashtag #buildyourbite with your recipe pictures! 4 servings as a main dish, probably closer to 6 as a side dish. Are you sure 1/4 cup minced ginger?? Seems like a LOT of ginger! That’s what I used! I love the flavor that ginger adds. But you can always use less if you want! If I want to add chickpeas to this when do you suggest I do that? With the rest of veggies? Roast them first? I was going to combine this recipe with your other stir-fry with chickpeas and baby corn. Yum! You can do it either way! Either put the chickpeas in with the other veggies or roast them separately. The easiest way would be to cook them with the veggies, but if you want them crispy you might want to roast them. Enjoy!! I followed your recipe and it was delicious! You nailed it! I will make this again and again!! !